Wooden Toys,Craft Kits and Games made from sustainable timber and natural materials for boys and girls to 'foster the imagination' and last a lifetime. Our Nature Play online toy store is designed to help parents, grandparents, relatives, friends and teachers to select appropriate toys and games for individual children, from babies to teenagers. modern and wooden toys lovingly created to encourage your children to play freely and imaginatively. 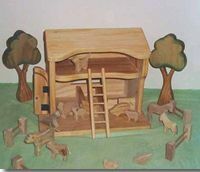 Shop securely for locally Australian made, eco friendly wooden toys, dolls, doll houses, farm toys, nature craft, wooden cars, trucks, and playstands, also toys suitable for Special needs, fine and gross motor, coordination toys. We also stock sustainably made toys and games from around the world and in particular from Europe and Germany including Art Supplies, Certified Organic Baby toys, Fair Trade products, Craft Kits & Steiner Waldorf books, Anthroposophical Books, silks and lots more. Constructive, Imaginative and creative playthings, books, wooden toys,educational and discovery toys, inspired by Steiner Waldorf education.